Many have wondered if Zach Snyder, helmer of 300, Watchmen, and the Dawn of the Dead remake, could successfully transfer his skills to a more family friendly genre. Then initial trailers appeared, with images of owls flying in slow motion through rain (it helped knowing that the film would be in 3D), and folks were rightfully concerned. This trepidation makes it all the more relieving that Snyder has successfully created a family friendly feature, albeit one that will appeal to more boys than girls. The story, based on the line of books by Kathryn Lasky, is occasionally convoluted but rarely difficult to follow. Soren (voice of Jim Sturgess) is a young barn owl, contentedly living at home with his little sister Eglantine (Adrienne DeFaria) and brother Kludd (Ryan Kwanten). He tells his sister grand tales of the legendary Guardians of Ga’Hoole, a mysterious group of owls that protect the weak and battle evil. Kludd is less convinced that they exist, and his cynicism spills over into his sibling rivalry with Soren. They are just beginning to learn to fly, but Kludd’s strength and over-exertion are too loud for barn owls. Soren’s graceful gliding is more highly praised by their parents, and this is just the beginning of their Cain and Abel conflict. In due course they are kidnapped by bumbling owls and taken to a place full of more sinister owls. These owls, led by Nyra (Helen Mirren), mate of the mysterious and supremely evil Metal Beak (Joel Edgerton), are kidnapping and brainwashing owlets to fulfill an evil plan to rule the entire owl kingdom. Soren manages to escape, while his brother is reserved for a darker fate. Soren eventually meets up with the Guardians, and together they fight against the evil owl forces. There are a number of battles in the film, all fought between owls with metal talons or natural claws. There is a great deal of clashing and slashing and pushing and throwing, and it seems very odd for there to be no deep red spurts of blood flying at the screen. Surely owls bleed, but in this PG-rated feature there is a total lack of realistic blood. That’s not to say that the film isn’t violent and atmospheric, and it may indeed be too intense and violent for children under ten. There are a number of harrowing moments and some intense chases, and the evil villains are quite evil indeed. Legend of the Guardians is pleasantly successful in most of its goals, and only on the edge of being too violent for its intended audience. It is a fine adventure film, with Australian-voiced characters that are a bit of a risk for a big studio not named Pixar. Soren is an admirable hero-in-process, and is very much the “good” portion in the good vs. evil fight. A number of important themes pop up, though a section wherein an aged warrior owl warns Soren about the less glamorous aspects of battle feels a little antithetical to the hyper-stylized fight sequences. Regardless, Soren learns important lessons and is eager to strengthen the weak and protect them from exploitation and destruction. Apart from the hurried story, my only complaint is that many of the owls look frightfully similar, though it is easy enough to distinguish between the good and bad owls just by their auras. The film is gorgeously rendered and extraordinarily atmospheric, with heavy lighting effects infiltrating most of the scenes. The soundtrack, so drastically overblown in the trailers, is more fitting in the film though it still leans toward the dramatic. An Owl City song played over the introduction of an owl city is humorous as an in-joke, but fortunately not terribly distracting. 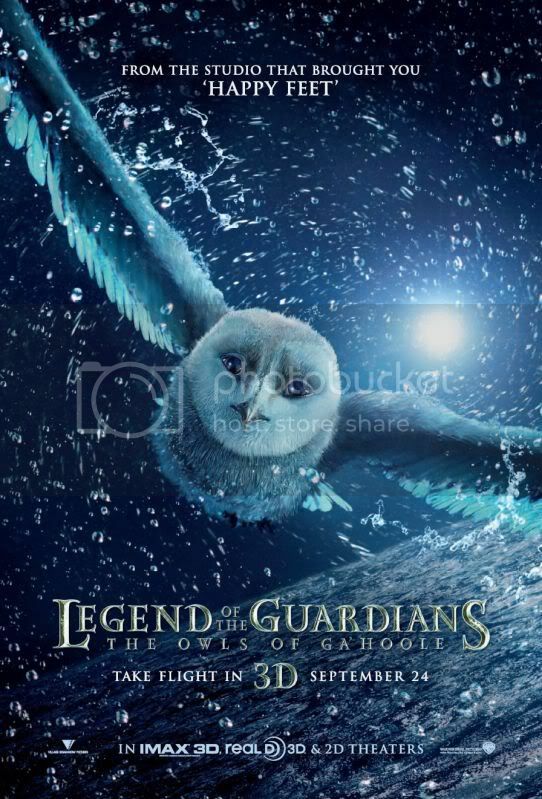 Legend of the Guardians is a surprising addition to Snyder’s relatively young oeuvre, in that it maintains his characteristic style while still being appropriate for younger audiences. It is also a rousing adventure tale, strikingly realized and presented. This entry was posted in 3 pirate flags, 3 stars, L, Movie Reviews, Pirate Flag Rating, Star Rating on September 24, 2010 by Tim Irwin. This is absolutely the most visually stunning piece of animated work I have ever seen. The director Zack Snyder did a great job on the film. But it was like he was constricted due to the fact that this was supposed to be a family movie. I’ve heard it said, this really isn’t a kids movie and this isn’t really an adults movie. I have a couple of suggestions that would really help this otherwise exemplary piece of work as well as any sequels that may be in the works. The first thing is, it would have been great if the movie would have been a bit longer. An extra half hour would have worked wonders for character and plot development. You don’t need to worry about kids sitting still for two hours with a story that’s interesting. Secondly, Just about every movie in existence, that has been produced now days, has an extended, unrated, non theatrical version on the DVD. The action scenes could be a lot more detailed and graphic in such a version. I’m not sure who to contact with this, so I’m going to post this to a few of the major blogs out there and hope there is someone listening that can get these suggestions to those that really matter and can put them into action.